On 25th of January 2018, at about 1428 hrs, a Gulfstream 200 (G200) with registration marking 5N-BTF, took off from Murtala Mohammed International Airport, Lagos (DNMM) at 1428hrs operating a chartered flight service to Nnamdi Azikiwe International Airport; Abuja (DNAA) with 4 passengers and 3 crew onboard. The commander was the Pilot Flying (PF) and the co-pilot was the Pilot Monitoring (PM). 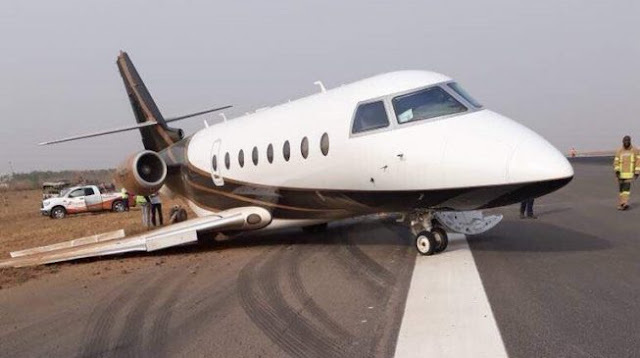 On January 25, 2018, at 1818 Universal Coordinated Time (UTC), a Nigerian registered Gulfstream G-200, 5N-BTF experienced a runway excursion during the landing rollout at Nnamdi Azikiwe International Airport (DNAA), Abuja, Nigeria. The airplane departed the runway surface and the landing gear was damaged. There were no injuries to the three crew members and 4 passengers. The Nnamdi Azikwe International Airport in Abuja has been reopened after being closed on Thursday afternoon. The runway was closed after a private jet (pictured) operated by Nest Oil skidded off the runway while landing and lost its landing gear in an attempt to return to the runway. As of 6:35pm when this report was filed, TheCable confirmed that only incoming flights were landing and no flight had taken off from the airport. Hadi Sirika, minister of state for aviation, first made the announcement saying the airport would be closed for 30 minutes with the Federal Airports Authority of Nigeria (FAAN) saying it had to carry out safety procedures. A witness told TheCable that FAAN officials had to push the jet off the runway with their hands. The runway is the only one available for use at the airport. In 2017, the airport was closed for six weeks to allow repair works on the runway. The Kaduna international airport was the alternative airport for flight operations at the time.